Hi everyone! After helping my students prepare for their finals and standardized exams this past spring, I was reminded of the importance of revising previous material in our history classes. Now, don’t get me wrong, revision is important for all subjects, and often we haven’t looked at some concepts and facts for a number of months by the time spring has come. However, I think this is especially important in history classes where the information we have to remember can be pretty overwhelming at times. We have to remember key people, events, eras, wars, and other things, and be able to answer some specific questions and write some in-depth essays that require quite a lot of historical knowledge. The term absolute monarch refers to a ruler in possession of supreme authority (such as a king or queen), where said monarch has absolute authority. This means that no laws or customs of the king or queen’s realm restrict their power. This power was derived from a widely accepted political and religious doctrine called “The Divine Right of Kings.” To put it simply, this doctrine stated that a monarch has been determined by God to be king or queen and that monarch answers to no one other than God. 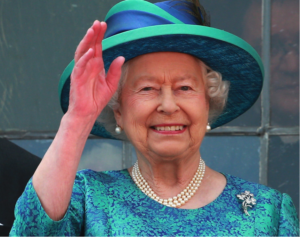 In contrast to the absolute monarch, a constitutional monarch, such as the current Queen of the United Kingdom, Elizabeth II (pictured below), has power that is limited by the legislature or constitution of his or her country. And yes, if you were wondering if absolute monarchs still exist today, they hold power in Brunei, Oman, Saudi Arabia, Swaziland, Vatican City, and the separate emirates making up the United Arab Emirates. Let’s take a look at some of the key absolute monarchs that you’ll need to know for your AP European History exam. Louis became known as the “Sun King” after attending a ballet at the age of 15 while dressed as the sun. His reign would last from 1643 until his death in 1715, making it the longest in European history. He embodied the divine rule of kings and ensured his power in France by only selecting recently ennobled and upper-middle class citizens to be members of his council. He is also famous for never calling a meeting of the Estates General, demonstrating just how determined he was to keep the rule of France to himself. 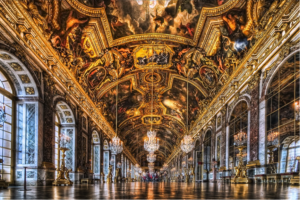 He famously made the Palace of Versailles the cultural, social, and political epicenter of court life. All nobles were required to live at the palace for a least a portion of the year so that Louis could watch over them to ensure none were trying to wrest control from him in any capacity. 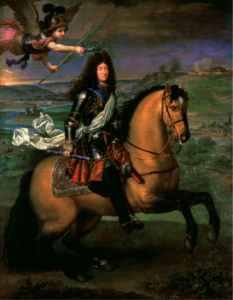 Louis XIV’s policies were also significant. While he was religiously tolerant in his personal life, he issued the Edict of Fontainebleau, which revoked the Edict of Nantes. In doing so, it ordered the destruction of Huguenot churches and closed Protestant schools. This led to a mass exodus of Protestants, who left France and sought refuge in places such as England, the Dutch Republic, Sweden, Cape Colony (South Africa), and North America. Under Louis’s rule, France expanded its territories, conquering parts of the Spanish Netherlands and the province of Franche-Comté. He later had mixed success in the War of Spanish Succession (1701-1713), with the Peace of Utrecht allowing for Louis XIV’s grandson to remain king of Spain, providing that the France and Spain would never be united under the rule of a single king. However, those same treaties also stipulated that France would surrender Nova Scotia, Newfoundland, or the Hudson Bay territory to England, which also took territories from Spain. 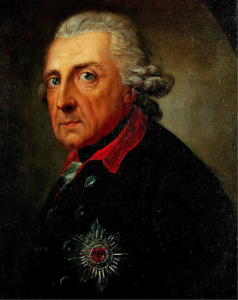 Frederick William I of Prussia was known as the “Soldier’s King” in reference to his high prioritization of strong government and his elimination of local self-government and parliamentary estates. He is accredited with having consolidated absolute rule in Prussia and for transforming his country into a military state. This later point can best be proven by the fact that while Prussia had the twelfth highest population in Europe, its military was the fourth largest and was famous for being the best. Known for his diligence and thrift, Frederick William I successfully fostered economic development, but imposed conscription to build his army. He later forced all Prussian men to serve as reservists and provided nobles with officer positions. Usually referred to as “Frederick the Great,” Frederick II of Prussia is most famous for his long reign (1740-1786), his numerous military successes, and his support of “enlightened absolutism.” The latter is the concept that the principles of the Enlightenment, such as the beliefs that truth could be found via the use of logic and reasoning, that nature was good and reasonable, that happiness should be pursued on earth rather than in the afterlife, that there was hope for progress for humanity, and that individual liberties existed and should be guaranteed by governments should be upheld by the monarch. He also famously befriended and corresponded with the important Enlightenment thinker and man of letters Voltaire. Frederick II also abided by the German concept of “cameralism,” which was the view that all aspects of a society should be employed to support the monarch and that the state itself should in turn use its resources and its authority for the benefit of the public. Frederick II’s successes in war were numerous. Early on, he managed to wrest Silesia from Maria Theresa of Austria shortly after she inherited the throne from her father, Charles IV. This was a significant accomplishment, as it allowed for Prussia to double its population to 6 million people. Maria Theresa would later form an alliance with Britain, Russia, and Sweden in hopes of retaking Silesia, conquering the rest of Prussia, and dividing Prussia among the victors. This plan was spoiled, however, when Peter III of Russia came to power and ended the anti-Prussian coalition in what is referred to as the Second Miracle of the House of Brandenburg (the first being Prussia’s miraculous successful defense of Berlin against forces nearly three times those of Prussia). 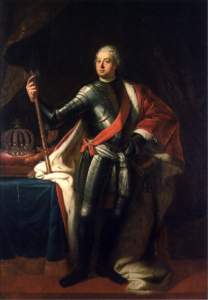 Peter III, who was an admirer of Frederick II, immediately ended the war against Prussia and offered to help Frederick II fight Denmark. Please join me next time as we look at some other important absolute monarchs and get ready for next year’s AP European history exam!